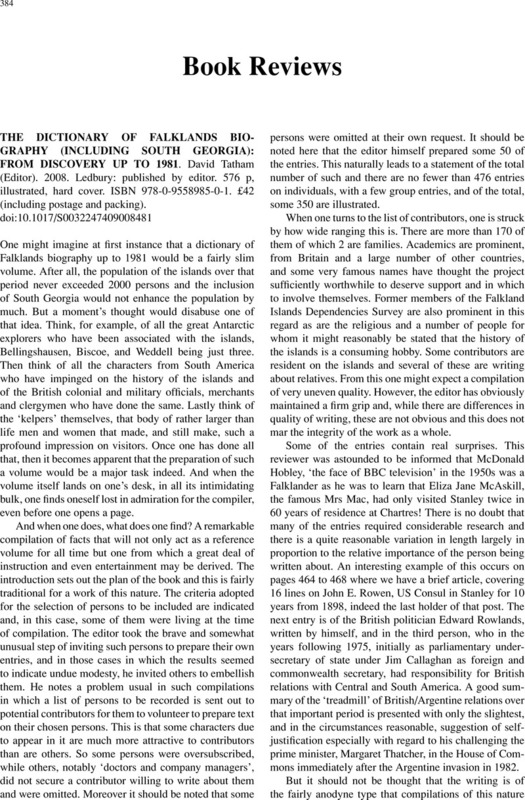 THE DICTIONARY OF FALKLANDS BIOGRAPHY (INCLUDING SOUTH GEORGIA): FROM DISCOVERY UP TO 1981. David Tatham (Editor). 2008. Ledbury: published by editor. 576 p, illustrated, hard cover. ISBN 978-0-9558985-0-1. £42 (including postage and packing). Scott Polar Research Institute, University of Cambridge, Lensfield Road, Cambridge CB2 1ER.